Excellent, inspiring, and educational look at the Holocaust. While the Holocaust is mainly characterized by the evil, atrocious deeds committed by Hitler's regime, it was also a time of great heroism. This book tells the story of many of the Gentile heroes who stepped forward and risked their own lives to save Jews. Obviously, many people did very wicked deeds, but these are condemned as such. Some of those who rescued the Jews were thieves, or had other issues, but this is not shown as right. Many people lied and some stole to protect Jews. Some Jews and others committed suicide. Though not a Christian book, it is narrated with a semi-Christian worldview. The underlying beliefs I noticed are that even in darkness there must be light; that good will triumph over evil; that there is good in the world; that human life is precious and ought to be protected; and that love, self-sacrifice, and courage are virtues to be exemplified. The faith of various people is mentioned, and the author discusses whether, overall, it affected who did what. God is not mentioned, but the Church, Christians, and Judaism are spoken of with respect. There is at least one instance recorded when a Jew-hider prayed for something and it happened. Jews in hiding suffer many physical ailments, including having their limbs freeze off. Mention is made of people who were flogged and tortured. The people are taught gruesome stories about the Jews' activities. Many, many instances are mentioned or related in which people were killed, often in far more disturbing ways than merely being shot. This includes the ruthless killing of children and infants. Alchoholic drinks are mentioned several times, and at least one man helps Nazis get drunk to keep them from searching his grounds. One man is said to have been repeatedly unfaithful to his wife. A woman and the Jew she hides fall in love; she has a child by him and they live together until after the war, when they marry. The Jews undress before being gassed. A Jew hides in a latrine. This book was written for people, like me, who know a little about the Holocaust but have not studied it extensively. While it does speak about Hitler's purposes and some of the horrific acts perpetrated on the Jews, as necessitated by the story, Rescue's focus is on the good, so that the evil is easier to handle. Outlined geographically, with a solid flow from chapter to chapter, it looks at individuals as well as groups, and the philosophies behind each person's choices. Each chapter has a simple map at the beginning, and Meltzer ties each event to the next with comments like: "In the village of Le Chambon all the people came together to save the lives of thousands of Jews. In the country of Denmark another spectacular act of human solidarity took place." This makes the book easy to understand. A few of the things this book really showed me was that God can use anybody, regardless of character or culture, to protect His people; that God is working even in the worst of circumstances; and that, while humans are fallen (thus the Holocaust happened in the first place) we are still made in the image of God and know to do right. 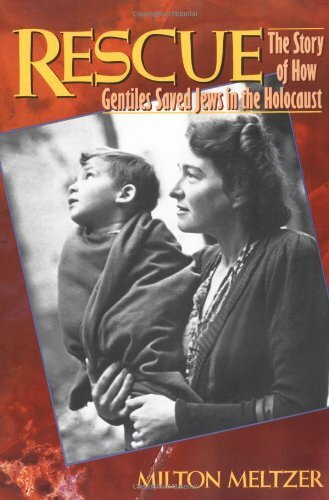 Incredible, inspiring, and thought-provoking, Rescue: The Story of How the Gentiles Saved the Jews in the Holocaust is a comprehensive look at that part of history, while being simple enough for those who know nothing before reading it. Highly recommended.